Cal Poly, San Luis Obispo. 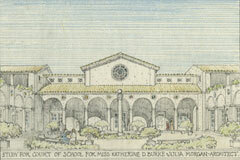 The Kennedy Library’s Special Collections and Archives department promotes the preservation and study of architectural records as an integral part of California’s cultural heritage. Materials collected include drawings and prints, correspondence, published and unpublished writings, business records, visual media, diaries, biographies, oral histories, ephemera and other original materials relating to architects and architecture, landscape architecture, environmental design, urban planning and engineering in California, with special emphasis on coastal and central valley areas of the state. Hooray, Monday! It's 12:54pm right now.